SPIRAX SARCO has launched a range of pressure-reducing microturbines that can generate electricity to reduce utility costs for steam system operators. Reported to be suitable for saturated or superheated steam, Spirax Sarco TR Steam MicroTurbines are available in two sizes, up to 700 kW. Higher electricity outputs are available on request. 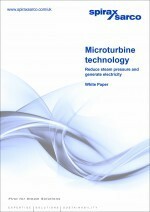 A microturbine producing 300 kW of electrical power can generate cost savings of more than £150,000 per year. The greater the steam demand, the more electricity the turbine will generate and the faster the payback. Industries with potential for using the microturbines include food and drink, chemical processing, pharmaceuticaland any facility with a pressure reduction requirement. The electricity produced can be used locally or exported and sold to the mains power grid. COFELY, a GDF SUEZ company, has been awarded a contract by BP to supply utilities to the SullomVoe Terminal (SVT) on the Shetland Islands – one of the largest oil and liquefied gas terminals in Europe. Cofely says the 11 year deal will also see it leasing the SVT power station and delivering a programme of major maintenance and investment works on the existing energy plant.